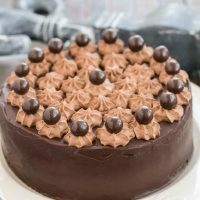 7 amazing chocolate layers that make for the most magnificent chocolate cake you’ll ever encounter!! Brace yourself for chocolate overload and a lot of swooning! Using a 9-inch cake pan as a template, trace a 9-inch circle on a sheet of parchment paper. Flip the parchment over and place it on a baking sheet. Place 4 egg whites, the cream of tartar, and salt in the bowl of an electric mixer fitted with the whip attachment. Beat on high until soft peaks form, about 45 to 50 seconds. Gradually add 1 cup sugar while continuing to beat on high. Whisk until stiff, about 1 1/2 minutes. Remove the bowl from the mixer and use a rubber spatula to fold in the remaining 1/4 cup sugar, 2 tablespoons cocoa powder, and the cornstarch until well combined. Fill to about 1/8-1/4-in from the edges of the traced parchment circle with meringue. Use an offset spatula to smooth the top and straighten the sides. Place the meringue in the preheated oven and bake for 15 minutes. Lower the oven temperature to 200 degrees and bake for 2 hours and 45 minutes. Remove from the oven and allow to cool for 45 minutes before handling. Increase the oven temperature to 325 degrees (to bake the brownies). Heat 1 inch of water in the bottom half of a double boiler over medium heat. Place 6 ounces semisweet chocolate in the top half of the double boiler. Tightly cover the top with film wrap. Allow the chocolate to melt slowly, about 9 to 10 minutes. Alternatively, gently heat in the microwave, stopping and stirring frequently. Remove from the heat and stir until smooth. Keep at room temperature until needed. Place 1 1/2 cups heavy cream in chilled bowl of a stand mixer fit with a whisk attachment. Whisk on high until peaks form, about 1 minute. Set aside. Beat 3 egg whites in a large bowl, until soft peaks form, about 3 minutes. Add 2 tablespoons sugar and continue to beat until stiff peaks form, about 2 to 2 1/2 minutes. Add a quarter of the whipped cream to the chocolate and whisk quickly, vigorously, and thoroughly, then add to the egg whites. Now add the remaining whipped cream. Fold all together gently but thoroughly. Refrigerate the chocolate mousse until needed. Grease a 9 by 1 1/2 inch cake pan with 1 teaspoon of softened butter. Dust the pan with 1 teaspoon of flour, tapping out the excess. Whisk together 1/4 cup flour, 2 tablespoon cocoa powder, 1 teaspoon baking powder, and 1/2 teaspoon salt a small bowl, and set aside. Set up a double boiler. Place the 3 ounces unsweetened chocolate, 4 tablespoons butter, and 2 ounces semi-sweetened chocolate in the top half. Tightly cover the top with plastic wrap, and heat for about 5 minutes. Remove from the heat and stir until smooth. Put 3 eggs, 1 cup sugar, and 1 teaspoon vanilla in an electric mixer. Using whisk, beat on high until slightly thickened, about 1 1/2 minutes. Add the melted chocolate mixture to the egg mixture and mix on medium for 30 seconds. Add the dry ingredients and mix on low for 10 seconds, then on medium for 10 seconds. Add the sour cream and mix on medium for 5 seconds. Remove the bowl and use a spatula to scrape the bottom of the bowl and make sure all dry ingredients are combined. Pour the batter into the prepared cake pan, spreading evenly with an offset spatula. Place the pan in the preheated oven and bake the brownie until a toothpick inserted in the center comes out clean, about 30 minutes. Remove the brownie from the oven and allow to cool in the pan at room temperature for 5 minutes. Turn out onto a cake circle and refrigerate for 15 to 20 minutes. Remove the brownie from the refrigerator and cut in half horizontally*. Keep the brownie at room temperature until needed. Heat 1 1/2 cups heavy cream and 3 tablespoons butter in a large saucepan over medium-high heat. Bring to a boil. Place 22 ounces of semisweet chocolate in a heat safe bowl. Pour the boiling cream over the chocolate and allow to stand for 5 minutes. Stir until smooth. Keep at room temperature until needed. Heat 1 inch of water in the bottom half of the double boiler over medium-high heat. Place 14 ounces semisweet chocolate, 4 ounces unsweetened chocolate, the water, instant coffee, and 2 tablespoons cocoa in the top half of the double boiler. Tightly cover the top with plastic wrap. Heat for about 5 minutes, remove the plastic, and stir the mixture until smooth. Keep at room temperature until needed. Place 5 egg whites in the bowl of an electric mixer fitted with the whisk attachment. Beat on high until soft peaks form, about 1 minute. Continue to beat while gradually adding 2 tablespoons sugar. Whisk until stiff, about 30 seconds. Whip 3/4 cup heavy cream in a well-chilled bowl until stiff. Fold 1/4 of the egg whites into the melted chocolate mixture, then fold in the whipped cream. Now fold in the remaining egg whites. Keep the mocha mousse at room temperature. Place a 9 by 3 inch springform pan on a baking sheet. Set the top half of the chocolate brownie inside the pan, top side up. Ladle 1 1/2 cups of ganache into the pan over the chocolate brownie. If needed, trim the cocoa meringue with a serrated knife so that it will fit tightly into the pan. Place the trimmed cocoa meringue, top side up, inside the pan on top of the ganache, pressing down gently on the cocoa meringue to avoid air pockets. Spoon the mocha mousse on top of the cocoa meringue, spreading evenly. Place the remaining chocolate brownie half, bottom side up, on top of the mocha mousse. Chill the cake in the freezer for 30 minutes or refrigerate for 1 hour. Remove the cake from the freezer and cut around the edges to release from the springform pan. Pour the remaining ganache over the cake and use an offset spatula to spread the ganache evenly over the top and sides of the cake. Refrigerate the cake for 10 to 15 minutes to set the ganache. Fill a pastry bag fitted with a large star tip with the chocolate mousse. Pipe a circle of stars (each touching the other) along the outside edge of the top of the cake. Continue to pipe out circles of stars until the top of the cake. Chill 4-12 hours before serving. Once melted, add sugar, heavy cream, cocoa, 2 tablespoons of rum, and salt. Whisk to combine. Bring to a boil and lower the heat, then allow to simmer for 5 minutes. Stir occasionally. Remove the saucepan from heat. Add instant coffee, vanilla, and the remaining 1 tablespoon rum. Stir until combined. Cut the Death By Chocolate into the desired number of servings. Heat the blade of a serrated slicer under hot running water before slicing into the cake. Repeat this procedure after cutting each slice, wiping knife to dry and remove excess chocolate. Serve with a generous drizzle of mocha rum sauce. Calories are for 1/12 of the cake. I cut my slices much thinner. *Tip for slicing the brownie layer. I place toothpicks around the perimeter of the brownie halfway between the top and the bottom, horizontally. I use those to guide my knife and start with shallow cuts around the perimeter, then inserting further in as I take my second pass around, continuing until the brownie is cut in half.